The revolutionary AION 500 MK2 is a high performance, IoT-enabled, massive size 3D printer that offers a professional-level build volume at an affordable price point. Armed with our patented AFPM (Advanced Fusion Plastic Modeling) technology, the printer renders a stronger and durable output. With multiple connectivity options and sensors, it is one of the most advanced 3D printers available in India. Offering a large build size, ultra-fast print speeds, minimal post processing, and unmatched precision, the AION 500 MK2 is designed for versatility. 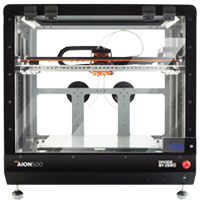 AION 500 MK2 is a fully enclosed industrial grade 3D printer and assures a consistently high print quality and repeatability. It has the Quick Load functionality for changing and loading filaments easily and a super-slicer feature that makes sure there’s no time lost when the print is initiated. The machine is easy to use allowing the user to alternate between quick-&- easy and pro printing smoothly. AION 500 MK2 also offers advanced features like Wi-Fi connectivity, in-built camera, utilization tracker, intuitive filament sensor and liquid cooling mechanism. From prototyping to low-volume manufacturing, the AION 500 MK2 excels at any design application with impeccable accuracy and cost-effectiveness. AION 500 MK2 is designed to add maximum value to professional work setups. An intuitive interactive touch screen computer monitors and reports the status of ongoing 3D print jobs in real-time - accessible wherever you go. AION 500 MK2’s high endurance extruder mechanism with a maximum temperature of up to 350°C along with liquid cooling allows print compatibility for Ultem 1010, Ultem 9085, ESD safe PC and other high-performance materials. It features a hybrid extruder mechanism that can accelerate print deposition of up to 30-50 gm per hour. This speed of printing coupled with the large build platform of the AION 500 MK2 empowers 3D printing for prototyping and low-volume batch manufacturing. An IP-based on-board camera allows the users to check live feed of the ongoing print, wherever they go. This machine allows multi-user control of up to 10 accounts via a browser-based interface allowing designers, operators and other stakeholders to connect through a secured access point. The AION 500 MK2 features a smart machine utilization and downtime tracker along with automatic alerts on print completion or critical errors, ridding users the inconvenience of continuous manual checks. Activated carbon filter continuously cleans air inside chamber, providing safer work environment for users. 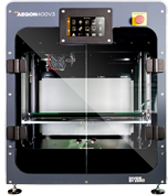 The AION 500 MK2 is housed in a high endurance and rigid 5mm sheet metal enclosed body that helps maintain stable chamber temperature for controlled heat dissipation leading to seamless adhesion and uniform print consistency. Despite being equipped with the patented AFPM technology and an industrial grade massive build volume, AION 500 MK2 is placed at an affordable price point and has a low running cost of running (Rs. 6/gm), thus offering value for your money. The AION 500 MK2 is compatible with a wide range of material such as ABS, PLA, TPU, Wood-infill, PETG, HIPS, Carbon Fiber, Polycarbonate, ULTEM 9085 and special AFPM-enhanced materials. Divide By Zero has incorporated a fast response filament sensor that continuously monitors and actively repairs extruder clogging, thereby ensuring zero failed prints and a high level of reliability in the fast-paced prototyping and production environments. This large volume 3D printer can be connected via USB, Ethernet and can be used with Wi-Fi as well. Now that you can securely access the machine’s control software along with semi-automatic print queuing functionality. Despite being a sophisticated machine, AION 500 MK2 is quite simple to use. It features an on-board touch screen, a user-friendly interface, auto-bed levelling and an easy-clean bed platform. 13. 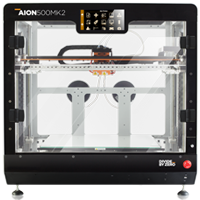 What makes AION 500 MK2 an industrial grade 3D printer? AION 500 MK2 is a reliable machine that assures lesser downtime due to its efficiency, thus guaranteeing a high-quality product every time. This machine follows strict safety protocols to avoid any damage to the operator or to the vicinity and is non-polluting as well. Despite being well-equipped to handle complex prints, AION 500 MK2 is easy to use. There is no dependability on a technical expert and the time spent on training the new user is drastically reduced. USB, SD card, Wifi & Ethernet.